Meet the artist who thinks music can show people that they aren’t the sum of their sins. What if Christian songwriters took their music to the next level? What if in addition to inspiring the church, their music went out among the lost and broken and invited them in? Lenise Morales was born and raised in Philadelphia. At Eastern, she’s studying Entrepreneurship and Business, which she plans to use to support her passion for music and ministry. Lenise had always brought music to the goals before her, but the Campolo Scholars program has helped her channel it in even more meaningful ways. 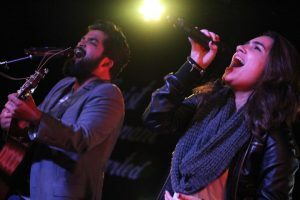 Lenise frequently leads worship at Eastern University and in her home church. This summer, Lenise will be recording her first solo album (see one of the songs here! Out of the Dust). While her background is in worship music—which reaches who are already believers—she has been inspired to write songs that might not be “church songs;” songs about day-to-day things that invoke hope and can invite people into an encounter with God. Easier said than done. One of the biggest challenges Lenise sees for the church is the number of people who have been hurt by Christians, or consider themselves unlovable by “good people.” Rather than try to talk them out of their own pain, Lenise wants to use her art to touch them. The American church is in decline in our post-Christian, secular society. Churches are closing, and our best and brightest are not entering ministry. Tony Campolo has worked tirelessly in ministry for over five decades. The Campolo Center for Ministry is the next and biggest step in his vision for Christian leadership development and church renewal—a partnership with Eastern University that sets out to transform the church by identifying and preparing the next generation of church leaders. Lenise says: “Tony has shown me the importance of surrounding myself with people who can drive me forward and help me grow, and making evangelism central to everything I do. The program has informed and enriched how I write my own worship music, and I’ve also been able to tell other people’s stories through songs.